or loosely translated in 'southern' .... Let the good times roll! It's a saying I heard many times growing up in south Louisiana. I really miss the culture, the food, and the traditions of my youth. The spoken language of my childhood combined all sorts of French, Creole, Cajun and just plain old 'local' linguistics. My granddad loved to throw around his French phrases and loved getting the expected responses from his grandchildren. I made this quick and easy table runner while I was on retreat last weekend. I used 8 strips (2"x 16") for each block. Since I only used four colors, I repeated two of each color in each block. By sewing the strips together into a panel, then folding the panel in half lengthwise and sewing the first strip to the last strip, making a tube, I could then slice the tube into 2" sections. I unstitched each section at a different seam and arranged them into the cascading order for each block. I did this in one day. It is much speedier and easier than it looks, I promise! 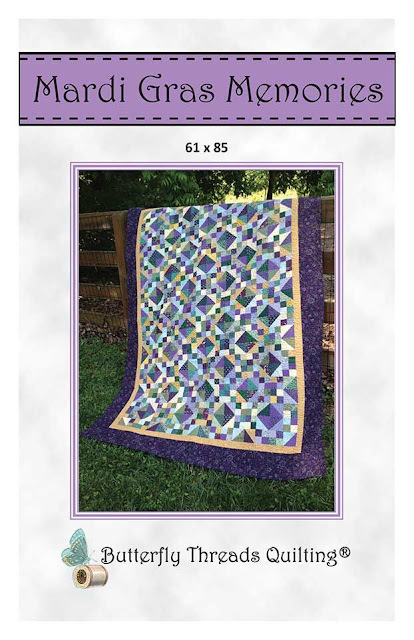 Take a peek at Angie's version HERE and see what she's making with this block. Isn't it fun? I always miss the Mardi Gras Season this time of year. One year, I made this quilt to help with the homesickness. This year I decided a wreath and a table runner were the answer. The extra beads leftover from the wreath project ended up in a bowl on the table. I really want to make a few more quilts to celebrate this season, but those might not happen this year. I will say that I do love the sunsets this time of year. The cold rainy weather and lack of any carnival season here in Georgia, along with the short daylight hours, make this the hardest time of year for me. It's a countdown to spring for me and I always feel like I have triumphed once I've survived January. So if I can't go to Mardi Gras, at least I can create some reminders here at home. Your wreath and table runner are gawjus! I can relate to making the runner, but I have no idea about the wreath. And I especially like the colors/fabrics used in the runner. Lovely. Hang on! Spring is almost here. It's a kind story, Diane! I feel as you ! I miss springtime!!! Here, in France we have rainy days for too long time. Seine is bursting its banks (I am not sure for the words! )profite des bons moments! Spring is just around the corner... !! Your table runner is "très joli" Diane !! We have a gal in our bunco group that LOVES Mardi Gras (no clue why as she's not LA affiliated..HA) so she almost always signs up the month when Mardi Gras is and has the Mardi Gras theme goin' on. We each get to pick a bead necklace to wear while we 'roll'! That's a great idea for the table runner which could be adapted to any season. I'm thinking an Easter version should go on my to-do list. Hmmmm. I'm with you on getting through the dark days. I always get excited when the daylight lasts until 6 PM. Your little reminders of Mardi Gras are wonderful! I have never been to Louisiana, but we have a similar French cultural heritage here in Maine. The Acadien dialect is fun to listen to, but often a bit difficult to decipher! I adore your table runner. The Madi Gras color combination is one of my favorites!